Heroes, Heroines, and History: Black Point - A Step Back in Time is Only a Boat Ride Away -- Plus a Book Giveaway! Black Point - A Step Back in Time is Only a Boat Ride Away -- Plus a Book Giveaway! 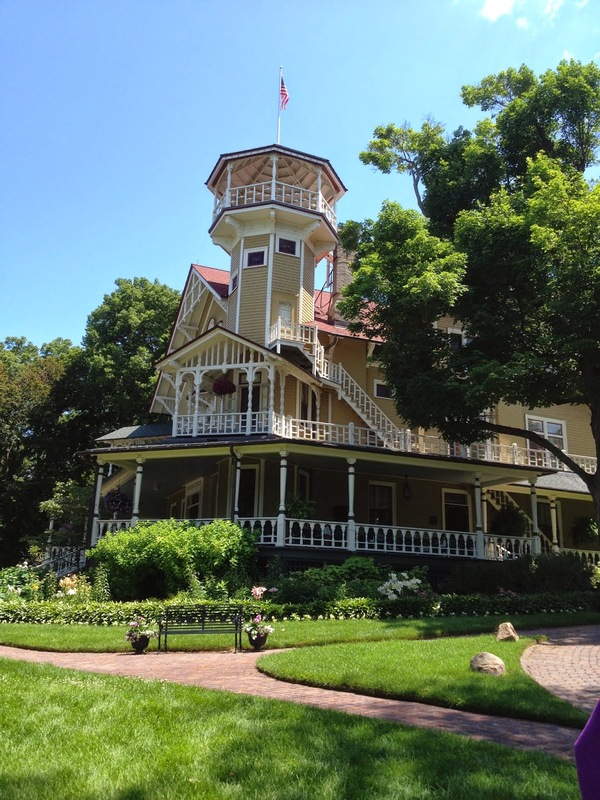 I recently toured Black Point, an authentic late 19th Century Victorian home that sits on the shores of Geneva Lake near the town of Lake Geneva, Wisconsin where I grew up. Since the early 1870s when the Great Chicago Fire caused many of Chicago’s wealthy to build homes on the lake to get their families out of the scorched city, the shoreline has boasted of many magnificent mansions. This was the first time I was able to actually step inside one, and it was like time traveling back to the 1890s. 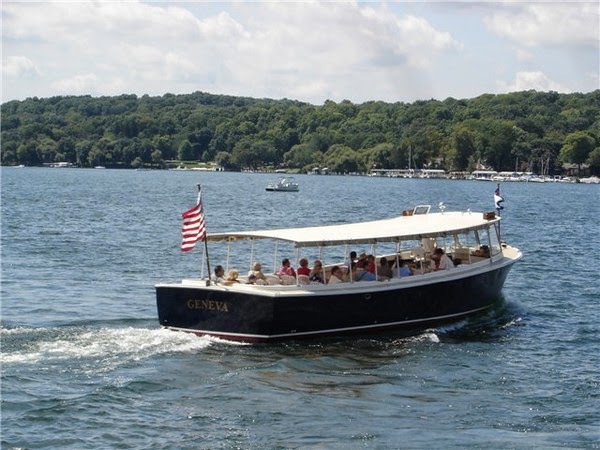 The tour began by boarding the small excursion boat, pictured here, at the Lake Geneva docks and traveling over water much the same way the home’s family had to do because until the 1920s, roads to the lake's south shore did not exist. We disembarked at Black Point’s pier and then climbed 110 steps that zigzagged their way up the bluff, though a forest. When we stepped out into the bright sunlight, we entered a world that has long been passed by. Conrad Seipp, who made his fortune in breweries, built his 20-room Queen Anne home in 1887, and when the home was completed, he’d spent $20,000. It’s mind boggling to think that all the building materials had to be ferried from town to the home by boat, and in the winter by sleigh. The same was true for their furniture. A team of horses would haul wagonloads up the steep incline. 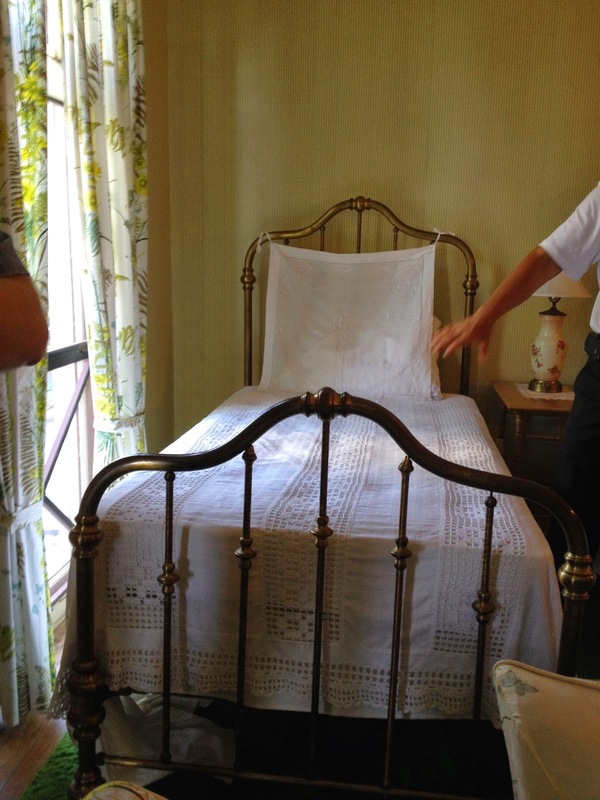 Four generations of Seipps used the home every summer until it was donated to the Wisconsin Historical Society. The home has about six bedrooms on the second floor and more on the third floor to accommodate the large family and generations to come. Pillows had covers to prevent insects from touching the pillow cases. The main floor consisted of a music room, living room, billiard room and a dining room. During the four generations, the only major remodeling was to add a kitchen wing on the back after the home acquired gas lines and electricity. Before that, the kitchen was in a separate building to prevent fire in the all-wood structure. Most all of the furniture is original to the home and in excellent condition. My only disappointment was not being able to climb to the turret to the overlook. The view has to be magnificent. We ended the tour on the magnificent wraparound porch that invited me to ask for a glass of sweet tea and sit a while and imagine what it would have been like to live back in the day when ladies had to wear layers of clothing no matter how hot it was, and there was no air conditioning either. You can read more about Black Point at their website. If you are in the Lake Geneva area, I highly recommend the tour. Information can be found at the Lake Geneva Cruise Line. In keeping with the theme of this post, fellow CFHS blogger Susan Page Davis is offering one of her wonderful mysteries called Pieces of the Past as a giveaway!!! When Sarah Makes a quilt out of her father's old flannel shirts, she brings it to the nursing home for him and meets his new friend, Vern, a fellow veteran. Vern tells Sarah about Alice, the woman he planned to marry before WWII. Vern always wondered what happened to Alice, and Sarah offers to help him track down his long lost love. - But as Sarah digs into Vern's past, she soon discovers that his story doesn't add up. To win this mystery, leave your name and contact information in a comment below and I'll get your name in the "randomizer." Please leave your comments by FRIDAY, AUGUST 8, 2014, and then watch to see if you are the winner! Oh Pamela. I loved reading this. I sure would love to be able to visit this place where you grew up. And, woulg be magnifisent to see this mansion. It hurts to know all of those places were torn down. How horrible. I would want it like it was except to do like these people and add a room and get elec. when it was available. You were lucky for me once so maybe I can win on this post. Thanks for the give-away. And thanks to Susan Page Davis. GOD bless. I would absolutely love to read this book. Thanks for the giveaway! I did the mail boat tour on opening day this year. Jumping off the moving boat onto a wet dock did not look like fun. Loved seeing lake Geneva and I am glad they preserved the beautiful home. What a lovely home and a wonderful post! I enjoyed reading about this home and would love to visit it one day. I would love to visit this home and take the fun boat ride too. The story sounds very interesting. Love all those pictures, Pam, especially the dining room and wraparound porch. Any idea how Black Point got it's name? How far is this from Chicago? Thanks for sharing this post. Jillian, I have heard how the name came about. It wasn't called that at first, but I will have to go back and check to get my facts straight. Lake Geneva is about an hour's drive north of me and I live in the northwest burbs of Chicago, about seven miles NW of O'Hare. From downtown Chi, it would take a couple hours. That would be such a wonderful home to tour!! 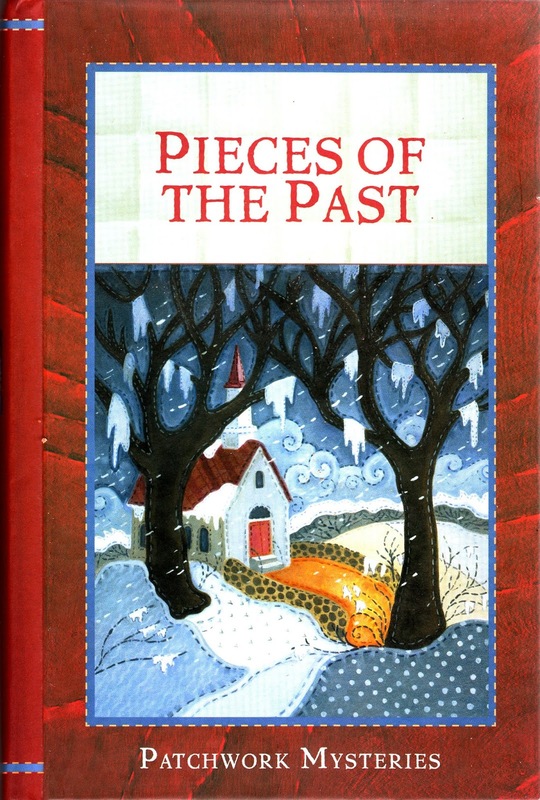 Passages to the past sounds interesting - I want to find out how Vern's past didn't add up! Great post! Thank you for sharing! I would love to read this book. My grandmother grew up on an island off the coast of Maine and her home is still standing today. I am thankful to those that choose to preserve history! I would love to tour this grand home, it's beautiful! Thanks for a lovely post. Wow, what a beautiful home! Thanks for sharing!